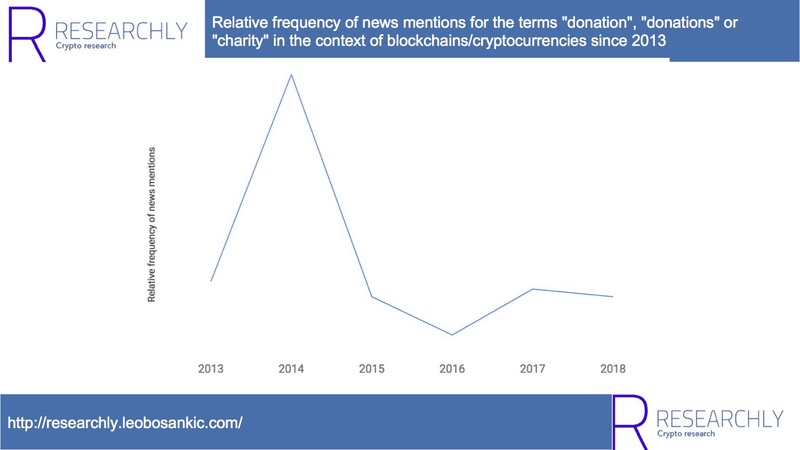 Crypto donations have been around for quite a while (the Freedom of the Press Foundation has been accepting Bitcoins since 2013) and lately, they have been picking up in interest again, according to Researchly’s industry sentiment tool. Researchly’s industry sentiment tool is extremely new, so please take this analysis with a grain of salt. As such, Binance’s announcement last week to donate $1,000,000 to West Japan’s flood victims is one of the most recent ones. Because I believe that crypto donations have not received the attention they deserve, this post examines them in more detail. It first shows the three different types (fundraising, charity coins, and crypto-foundations), explains the drivers behind them (crypto wealth and inefficient traditional donations), looks at three benefits of crypto donations (financial support, banking the unbanked and pushing crypto diffusion), and concludes by looking at the future of crypto donations (the role of Stablecoins, rise of autonomous funds, establishing proof of impact, managing fund distribution). Based on Paul Lamb three types of crypto donations exist; Fundraising, Charity Coins, and Crypto-foundations. Fundraising refers to raising money through cryptocurrencies. bitcoins since 2013 and added additional cryptocurrencies in June. In 2014, the Red Cross started accepting Bitcoin-donations. Last week, Binance announced that they are donating $1,000,000 to West Japan’s flood victims and that they are also accepting donations from the community. Also last week, Binance appointed UNIDO’s Goodwill Ambassador Helen Hai as head of their Blockchain Charity Foundation. 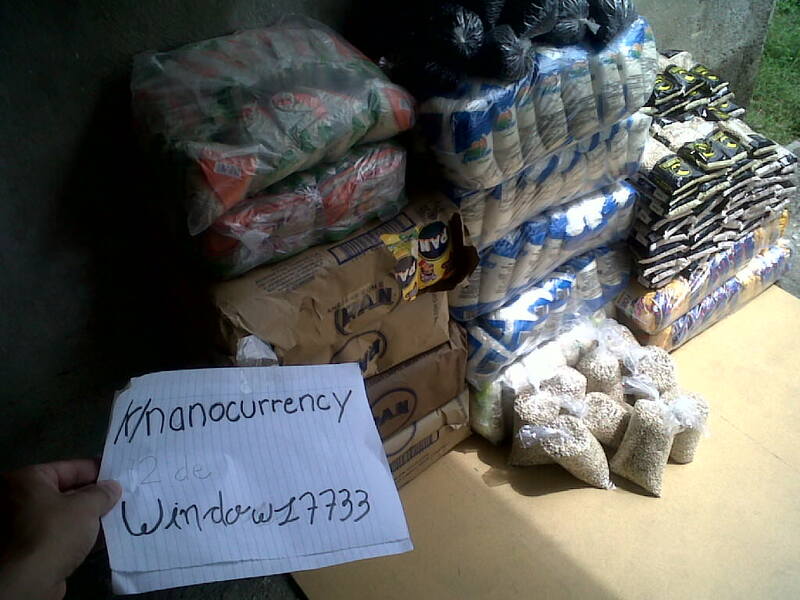 Moreover, Cryptovest describes in an interview how a Venezuelans Redditer called Windows7733 collected $230 in donations (through NANO) from Reddit users to buy food for his fellow citizens. The Redditers donated to his NANO address and he proved the use of the proceeding through username-signed pictures 1. Charity coins refer to cryptocurrencies focusing on donations. In Environmental-friendly, ecological, and donating cryptocurrencies I wrote about, among others, PinCoin, a platform where a certain amount of staked coins is automatically donated to selected charities. Admittedly, I am unsure about this project’s seriousness. Crypto-foundations is a term I first read in Paul Lamb’s Crypto-philanthropy: How Bitcoin and Blockchain Are Disrupting the World of Giving. It refers to foundations that consist solely of cryptocurrencies. For instance, in June, Coinbase announced GiveCrypto.org a charity that by the time of the announcement had raised $3,5 Million (although $1 Mio. came from Brian Armstrong, Co-Founder, and CEO of Coinbase). This being said, let’s look at how crypto donations exist in the intersection of inefficient traditional donations and the advantages and effects of blockchains/crypto. A lot of wealth has been created from cryptocurrencies. And as the Pineapplefund, who runs under the slogan „because once you have enough money, money doesn’t matter“, shows, that wealth can as well be donated. Besides that, cryptos posse technical capabilities that are well suited for donations. As they are infrastructure-less anybody can send and receive them, donations can be sent directly to recipients without middlemen and the associated fees, they allow efficient cross-border donations, the transactions of small amounts, and the flow of funds is fully tracked. However, maybe even more important is that they are censorship-resistant. For instance, PayPal stopped processing WikiLeaks-donations in 2019. Such censorship is nearly impossible with blockchain-based donations. Based on these prerequisites, crypto donations can impact not only people but the crypto and financial industry. The impact of crypto donations is threefold. Besides the obvious financial support, I believe it is important to highlight their impact on the overall crypto and financial industry. In regards to the financial industry, they are a way to bank unbanked people. To receive donations, recipients only need a smartphone with internet access. Given the high availability of phones (especially when compared to access to bank accounts) and openness of blockchains, donations provide an easy way to distribute bank accounts and money to the unbanked population. However, what remains is the fact that previously unbanked people won’t be able to convert crypto to fiat. This will either lead to the emergence of local exchanges that trade crypto for cash or the absence of these exchanges will force the presence of crypto, i.e. people will start transacting exclusively with crypto. In the long-run, the emergence of such a crypto-to-crypto economy shows how crypto donations could support the diffusion of cryptocurrencies. Relative Advantage: Measures how much better an innovation is compared to the solution preceding it. Compatibility: Measures how similar an innovation is to existing values, past experiences, and users’ needs as perceived by potential adopters. Complexity: Measures how difficult to understand an innovation is. Trialability: Measures how much an innovation can be tried on a trial before implementing it fully. Observability: Measures how much the results of an innovation are visible to others. The more present these categories in an innovation, the more likely its adoption; the better an innovation (relative advantage), the more it fits into people’s existing mindset (compatibility), the more understandable (complexity), the more it can be tried and observed (trialability and observability), the more likely its adoption. Here is how these categories unfold in crypto donations. Relative Advantage: Receiving crypto donations is better than not receiving any donations. I strongly believe that the easiness of crypto donations will extend donations to more donors and recipients. Windows7733’s case is one example. Compatibility: I believe we can draw similarities between crypto donations and other payments in developing countries most notably to M-Pesa, the phone-based payment system, popular, among others, in Kenya and South Africa. Whereas the underlying technology is different, both are a form of virtual payments. As such, M-Pesa (and similar solutions for that matter) serves as a great analogy for explaining cryptocurrencies. Trialability: With crypto donations, nobody must make any long-term commitments which allows for easy trials. Complexity: Whereas cryptocurrencies are difficult to explain, Windows7733’s example shows that understanding how they work might not be a requisite for their acceptance. Instead, it is important that people understand their features/result; the criticism that cryptos won’t diffuse because people do not understand their working does not matter because people understand cryptos’ features. In Windows7733’s the feature was „buy food for people who cannot afford it“. Finally – as so often – open questions remain. Here are a few I am still curious about. The role of Stablecoins: One upside of crypto-foundations compared to traditional ones is the potential upside of cryptocurrencies. Considering, however, the potential downside, the question is whether funds will be better off investing solely in Stablecoins or hoping for value growth. Rise of Autonomous funds – The role of intermediaries in charities: With Windows7733’s case, we can already see that donations work without intermediaries. But what happens if such donations are applied on a larger scale? In his essay, Paul Lamb quoted I Gave. I Gave is a DAO (currently available as a demo, see website) for autonomous charities operating based on votes by token holders. Such DAOs provide a way to remove intermediaries from the „donation business“. The question is how charities will react and whether, of course, large-scale charity DAOs can be built. Establishing Proof of Impact: Also a term I first read in Paul Lamb’s Crypto-philanthropy: How Bitcoin and Blockchain Are Disrupting the World of Giving refers to the need of proving that the donated funds fulfilled their intended purpose. If the donations remain on-chain they are easily tracked. However, the problem arises when crypto is exchanged for fiat. In the Reddit-case, Windows7733 proved the use of fundings with pictures. It goes without saying that this does not work on a large scale. A possible solution are prediction markets and I am curious to see that (or other solutions) being put in place. Managing fund distribution: In Charitable giving with cryptocurrency, Brian Armstrong pointed at two issues surrounding fund distribution; identifying the right people (i.e. people in need) and ensuring that these identified people receive the funds. In regards to the latter, Brain exemplified an AR-based solution (similar to Pokemon Go) where funds can only be collected at a predefined location. The problem with this, however, is that traditional positioning systems like GPS can be spoofed and so theoretically anybody could claim the donation. Proof of Location services which are working on tamper-proof geospatial data could be a solution here. Regardless of the solution, fund distribution remains a topic for experimentation.